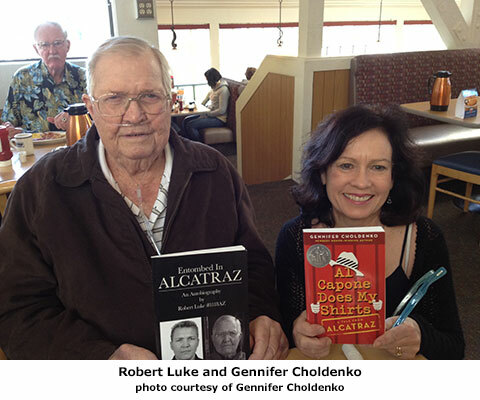 Robert Luke, Alcatraz convict #1118, was on the island from 1954-1959. Alcatraz was his sixth prison. No trouble with the law since Alcatraz. 1. While on Alcatraz, did you dream of being free? 2. Were you afraid during your years on Alcatraz? Never. I had a reputation for being extremely violent. People were careful around me. The only time I was afraid on Alcatraz was when I came back a few years ago and the ranger asked me to speak to the public. 3. What did you do to pass the time on Alcatraz? I read two or three books a week. (Checked out from the cell house library). I like history. I must have read The Decline and Fall of the Roman Empire three or four times. When I read a book, I actually become a part of it. My imagination helped, too. Sometimes I would take a trip up in my head. 4. Did you ever play baseball in the Rec Yard on Alcatraz? Yes. I was a fielder. There was only one fielder as we had six-man teams. There was no room in the recreation yard for more. 5. What happened when the ball went over the wall? If it went over the right field wall it was an automatic out. If it went over the center field wall it was a home run. If it went on the roof of the cell house it was good for two bases. 6. You have said your cell was “the size of a pool table “did it ever feel like home? No. We called it our house, but not a home. 7. I’ve heard you say that you didn’t seriously consider an escape from Alcatraz because as a US Navy man you understood how difficult it would be to swim to freedom given the currents in the bay and the temperature of the water. If you were to plan an escape from Alcatraz, how would you do it? The only chance would be if you worked outside. I was never allowed to work outside because I was an escape risk. The last warden was lax. He didn’t check the cells. That’s one of the reasons the (1962) escape happened. 8. 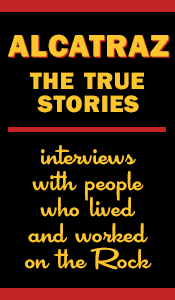 What question do you get asked the most? Did you know Al Capone? 9. Capone died before your time on Alcatraz, of course. Yes. But if I had been in prison with him, I would have kept my distance. I stayed away from connected criminals because they often have influence over the police or the guards. 10. But you knew Machine Gun Kelly, right? Yes, he played bridge on the recreation yard. 11. Did you have visits on Alcatraz? Only one. I didn’t like visits because they reminded me too much of what it was like outside. 12. What was your worst day on Alcatraz? My worst days were the 29 days I spent in the disciplinary cells on Alcatraz. 13. Did you ever see the kids who lived on the island? 14. What jobs did you have while on Alcatraz? I worked in the mess hall, the laundry and the glove shop. 15. Did you ever see contraband come through the laundry? No. They searched all the laundry. But if you wanted something, you could get it. In your book, you mention the fact that you were a good student. School was always easy for you. 16. What do you think made you cross the line and begin stealing? The excitement. I got carried away. I met someone who was doing it and the life just sounded exciting to me. It becomes easier the more you do it. 17. Why do you think you ended up on Alcatraz? I made the wrong choices. We are all born with the ability to make our own choices. But once you make the wrong choice, other people make your decisions for you. 18. Are there any Alcatraz movies that are accurate? If there was a completely true movie about prison, no one would go to it because it would be so boring. It’s the boredom that gets you. 19. You were one of the few men who were released directly from Alcatraz. How did it feel to leave? The colors and immense distances seemed astounding. I had just come from a place that had no color, and the farthest you could walk in one direction was less than 100 yards. The whole experience was really overwhelming. 20. What would you tell a kid growing up today? Go to school. Learn to read. The literacy rate of cons is so high. Make the right choices. I’ve heard you say that since your years on Alcatraz you’ve never been in any trouble. Though you write you had: “a hair-trigger temper.” You wrote a powerful poem about this which is on the back cover of your book. 22. How did you manage your temper after Alcatraz? It took time. I learned to walk away from an argument before trouble started. I had a few problems with it, but gradually I gained control. 23. After Alcatraz, did you dream about being in jail? Yes. For fifty-one years I dreamt about prison. The prison dreams only stopped when I went back to Alcatraz and began speaking to the public about my experience. Before that, only my family and my best friend knew. 24. In your book, you talk about the epiphany you had while on Alcatraz. You say that you realized “the truth, that no one was responsible for my actions but me.” If you could offer words of wisdom to your 14-year-old self, what would they be? Your choices will get you in trouble if you make the wrong ones. If you make a wrong choice, pull your foot back. Criminal history prior to Alcatraz: robbing banks, burglary, car theft and assault. Sent to Alcatraz for attempted escape at Leavenworth. No trouble with the law after Alcatraz. He has lived a happy, productive life for the last 54 years.